Quality always was and still is of central importance to us. We already started to describe our processes in 1977. In 1990, a management system was installed and certified in 1997 to ISO 9001 and VDA 6.1. In 2000, we decided to cover the requirements of the international automotive industry that exceeded the above standards, and thus we extended our management system by the scope of TS16949, and it was successfully certified in February 2001. 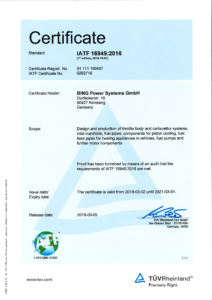 Since March 2018 we are certified according to IATF 16949. We not only want to cover customer requirements for certification, but also use the system actively to introduce continuous improvements, both on the products and the processes. Our environment is important to us! In parallel with the activities to reorganise the system to TS16949, we have also integrated into our management system the environmental issues that are relevant to us and had the system successfully validated in March 2001 to the EU Eco Audit Provision.